The best in the world at the best price! Please read and follow the instruction leaflet carefully. Wear suitable gloves, Rinse hair well after application. This kit contains: 2 tubes of Re-Pigmentation Creme, 1 Tube of Nourshing Shampoo, 1 pair of gloves, 1 instruction leaflet. You only want to touch up your grey hair?, Or would you like to regain your natural hair colour?. You decide on the frequency of application and duration of processing time. In doing so you can individually approach your desired colour result gradually. 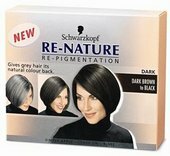 Regain your natural hair colour: Schwarzkopf ReNature is not a hair colourant, but a gentle Re-pigmentation Creme. When you start to get more and more grey hair, many men wish to regain their natural hair colour. But a hair colourant is out of the question. The experts from Schwarzkopf know the answer: Regain your natural hair colour with Re-Nature - Gradually, softly and gently. Hair Colourants and Re-pigmentation cremes can cause allergic reactions which in rare instances can be severe. Conduct a skin allergy test at least 48 hours prior to every use of this product, even if you have already used this or other colouring products before. So remember to buy this product 48 hours in advance. DO NOT USE THIS PRODUCT AT ALL IF. you have already experienced any reaction to this or other colouring products. you have a sensitive, irritated or damaged scalp. In these cases consult a doctor before using any hair re-pigmentation or colouring product. This product must not be used for dyeing eyelashes or eyebrows . Avoid contact with the eyes.